Up for a little more Obama inauguration news, as it relates to bicycles? The League of American Bicyclists reports: "Thanks to the Washington Area Bicycle Association (WABA), over 2,000 bike riders were allowed to enjoy the 2009 Presidential Inauguration and all its crowded festivities while they knew their bikes were being watched in one of WABA's free Bike Valet parking lots (photo above). 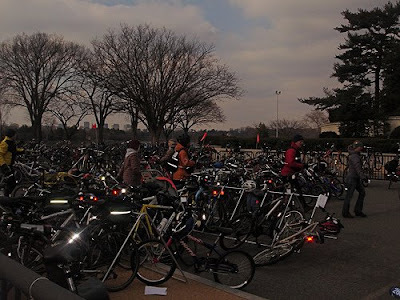 WABA provided two convenient bike valet stations in downtown D.C. that were manned by its staff and volunteers." Wonderful! Barack can help put bicycles valet in every major city!